Let me preface by saying that I fell in love with the Red Hen the moment I walked into the Bloomingdale restaurant. I don’t know if it was the raised ceilings, the bustling yet homey atmosphere, or the exposed kitchen towards the back, but the place felt real and not manufactured. Rachel and I had been meaning to check out Michael Friedman and Sebastian Zutant’s new venue since it opened to rave reviews back in April, so I thought it would be an excellent dining destination to celebrate Rachel’s birthday. First of all, Red Hen takes reservations! Considering how many new restaurants in the District have opened over the past year that only offer walk-ins, it was incredibly refreshing to know there would be a table reserved for us when we arrived. What a novel concept! And then there’s the menu. Oh look, an actual list of appetizers and entrees! 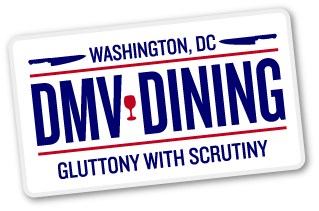 Judging by my sentiment you can probably tell that I am completely tired of small plates (with Rose’s Luxury being the rare exception), so I was thrilled when glancing over Red Hen’s menu that not only do they offer a traditional carte du jour, but the prices are rather reasonable, too. Like, really reasonable. But more on that later. After a drink at the bar (which featured some amazing Heroes of the Torah glassware), we were seated towards the front of the house with a terrific view of the neighborhood from our table. We started the evening off with an appetizer of grilled octopus. Topped with frisee and crispy capers while under a bed of Romesco sauce and shelling beans, the octopus was perfectly grilled and had some nice char to it. Both Rachel and I remarked how wonderful it tasted as it was a sign of things to come. Given how cold it was outside, we opted to split a bowl of their autumn squash soup. 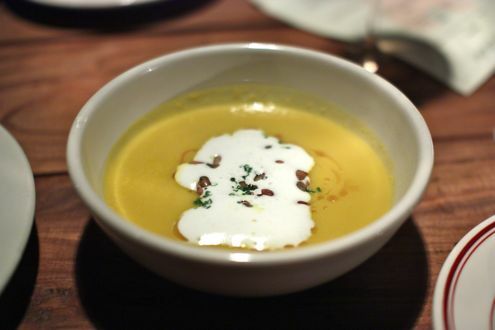 Prepared with pumpkin seeds, toasted squash oil, and a dollop of sage cream, the soup was simply phenomenal. Rich and flavorful, the soup warmed us right up as the bowl was scraped clean in a matter of minutes. Red Hen offers a handful of pastas as well as large plates, but each category represents an entrée-sized portion, so we decided to order one of each as our main course. 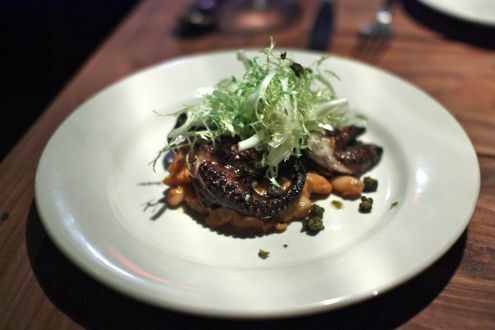 We ordered the Creste de Gallo, which was prepared with braised duck, wild mushrooms, sweet potato, and basil. 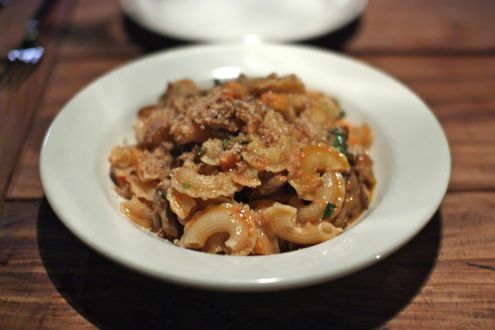 The homemade pasta blended seamlessly with the hearty, tender pieces of duck. We really loved this dish, and considering it only cost $17 and was a slightly larger portion of pasta than what you’d find at, say, Casa Luca (where most pastas run for over $20), this was an exceptional value. As for the large plates, while we initially decided upon the grilled short ribs, we thought it might have been too heavy after ordering the pasta with braised duck, so instead went for the wood-grilled chicken ‘Fra Diavolo’. It turned out to be a great choice. The incredibly moist chicken rivals Palena’s excellent bird, though the Red Hen’s recipe offers more of a kick with its spicy seasoning. 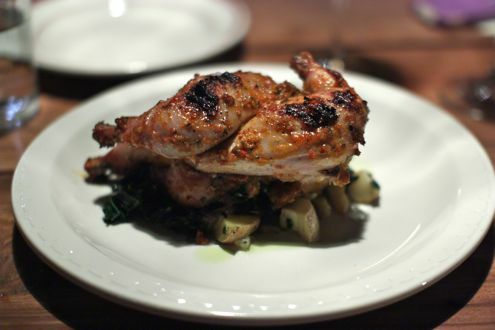 Placed atop a bed of Swiss chard, roasted potatoes, and currants, this was one terrific piece of poultry. Juicy and tender, we loved each bite. 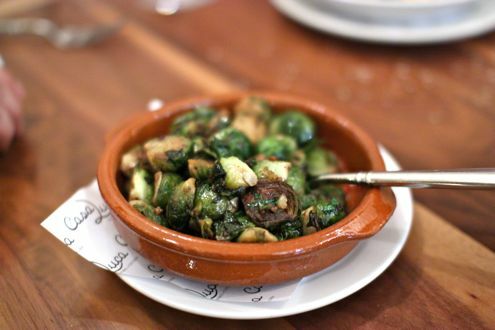 We also ordered a side of their crispy Brussels sprouts. Blended with a dill and anchovy aioli, we absolutely adored this side dish. The Brussels sprouts had just the right amount of crispness while the mild sauce really complemented the vegetable. Closing out the evening, we split a dessert of pumpkin cake with hazelnut sauce and brown sugar gelato. 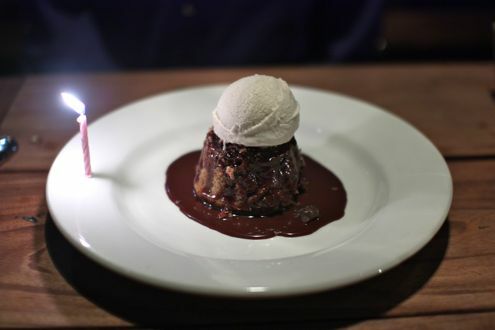 Accompanied with a birthday candle, it was delicious but may have been the weakest course of the night. We were expecting a warm cake but it was actually served room temperature, but the sauce made it delicious while the homemade gelato made for a great ending to a spectacular meal. And while the service was a little slow at times, I was more than happy with our experience at the Red Hen. Rachel and I kept remarking how great it was to not only see a restaurant offer outstanding food without resorting to a small plates menu, but also offer reasonable prices too. It’s something this city lacks, and I am extremely jealous of those who live in Bloomingdale as they have a neighborhood spot to call their own without having to trek to other parts of the District. We can’t wait to go back.